Finding transcription from home jobs isn’t something that seems to always be readily available. While there are jobs out there that hire for transcription jobs, thousands of people apply for these positions and the competition can be fierce. While you should always apply if there is a remote job that catches your eye and matches your skill set, be sure to have your resume updated before you start your job search. When you see those transcription work from home jobs that you want to apply for, you don’t have the time to redo or update your resume. You have to get it submitted as soon as possible to compete for that open position. 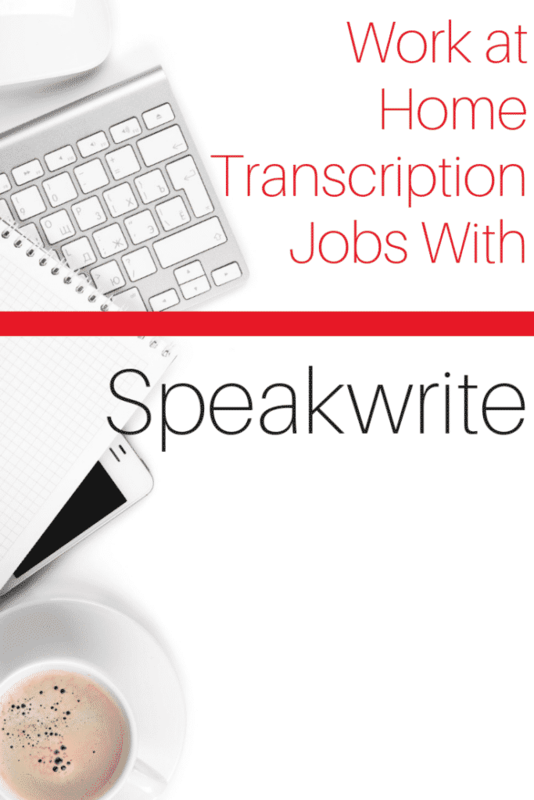 When it comes to applying to a great company that offers several transcription from home jobs year-round, SpeakWrite is a great company to work for. If you are interested in the potential of working for them, get that resume ready and brush up on your typing skills! SpeakWrite is a large company that is known for providing transcription services for many companies in the private sector. In fact, their client base is so large that they state that they provide services to over 1 million (yes, million!) customers per year. That is a ton of work that is waiting to be done! The best part? Their employees work from home! If you are looking for a remote job that fits your skill sets, this may be a great company for you. You must have a typing accuracy of 90% with an average of 60 WPM typed. And yes, they will give you their own typing test for you to prove your skills. Practice ahead of time and work on those typing skills! Being fluent in English is a must. To be considered for employment, you must be a resident of either the US or Canada. If you are applying to be a legal transcriptionist, you must have 2 plus years of legal work in a law office and a good knowledge of the law and how the court system works. To be considered for a general transcriptionist position, you must have 1 plus years of transcription experience that was done in an office setting. Since SpeakWrite has a ton of clients in the private sector, they do require that all their employees and contractors undergo a background check before hire. While they do pay for it to be done, it is a requirement for each and every person who is being offered a position. Interested in other transcription from home jobs? 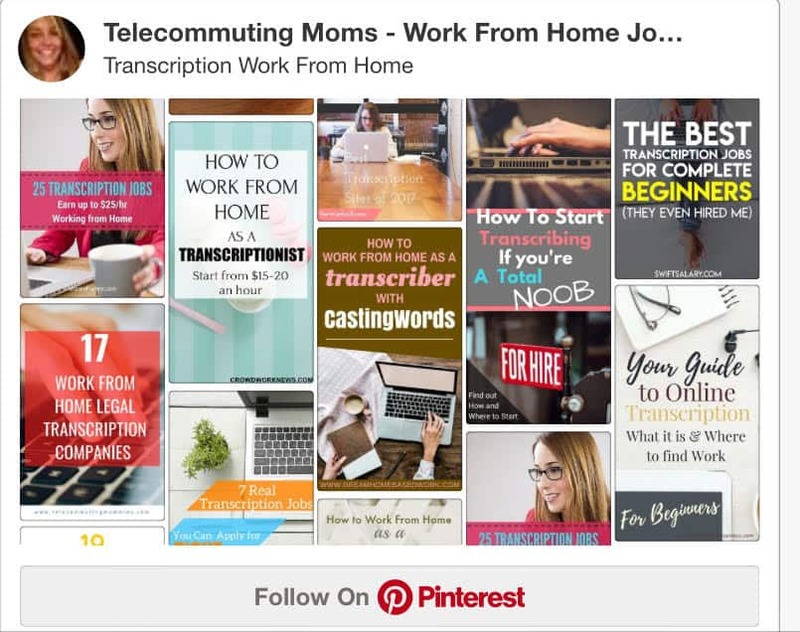 Check out our Transcription Work From Home Pinterest Board. Well…first off…you can work from home! That’s a huge selling point right there and the reason why so many people apply and want to work for them. Another huge perk is that your schedule is flexible and you can set and work your own hours. The pay structure is competitive within the industry making it also a nice bonus to be able to be paid well, all while working from your own home. What are you waiting for? If you have good typing skills that are accurate, and you have the drive and the desire to work from home, SpeakWrite may be just the company that you’ve been searching for. Practice up on your typing skills and test your speed and accuracy a lot before taking their timed test. The more your practice, the better you’ll get which will then increase your odds of getting transcription from home jobs with this company! Don’t have the skills needed? Consider taking a training class to further your career. Some of the general transcription companies hire people without experience, but many of these companies especially the more specialized ones require some training or previous experience in transcription. There are a lot of courses and programs out there to teach you transcription if you have no experience but many of these are scams or just don’t have very good reviews from previous customers. The only one I usually recommend for those looking to start a transcription career is Transcribe Anywhere. They offer a free mini-course for those interested. They also have a legal transcription free mini-course for those interested in specializing in that, it is even higher in demand. This post may contain affiliate links but I never recommend products or services I do not believe in.